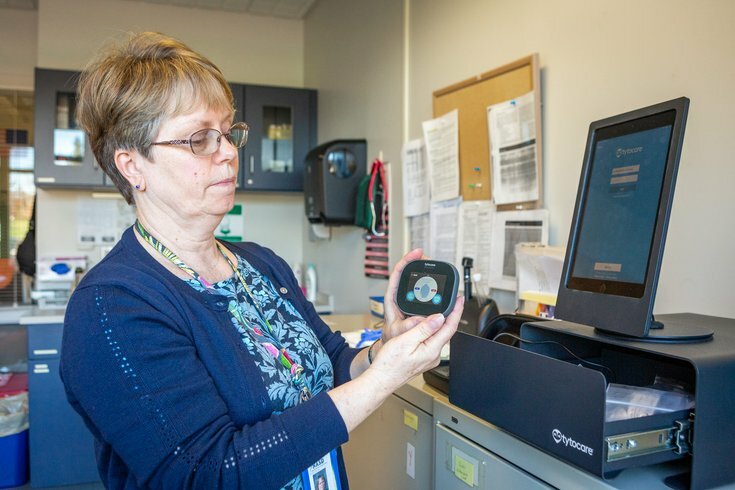 Eileen McKeron, a nurse at East Norriton Middle School in Montgomery County, holds a Tytocare device that enables doctors based at the Children's Hospital of Philadelphia to remotely examine students at the school. CHOP offers the program to students for free, knowing that many in the Norristown Area School District lack health care. Altruism may be the first necessity for a live kidney donation, but it is hardly the final one. Potential donors must endure all sorts of medical examinations, part of an arduous process designed to ensure both the donor and the recipient achieve healthy outcomes. Still, Don Flanagan faced an additional hurdle when he decided to donate a kidney to his brother two years ago. He lived in Cincinnati. His brother was a Jefferson Health patient in Philadelphia nearly 600 miles away. Traditionally, that distance would have required Flanagan to visit Philly at least twice – once to complete a series of prerequisites and again for the surgical procedure. But thanks to advances in telemedicine, Flanagan was able to complete the pre-surgical protocol in Ohio. 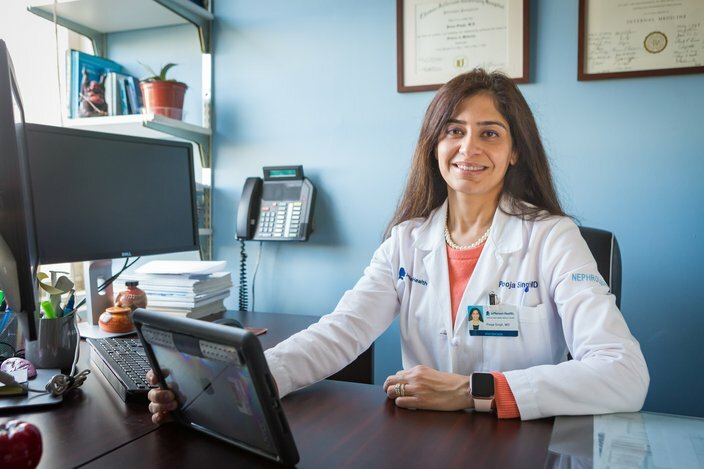 "We have made it way more convenient and, I feel, somewhat financially neutral for the donor to be able to embark on this locally," said Dr. Pooja Singh, medical director of Jefferson's Kidney and Pancreas Transplantation and Living Donor program. "Once they complete all the steps that we feel will make them pan out, then we make them travel." Flanagan, 55, first discussed his candidacy with Jefferson's medical team through a video teleconference platform, providing his medical history and asking various questions. He then completed the necessary medical tests near his home, forwarding the results to the Jefferson team. Finally, he flew to Philly. "This was a way for me to do things remotely," Flanagan said. "It had a minimal impact on my work-life balance. The first time I went to Philadelphia and met with the doctors was right before we did the procedure." Jefferson surgeons conduct about 30 live kidney transplants each year, Singh said. In the last two years, they have done six with the assistance of telemedicine. Singh expects that to become more common. It's just one way that Jefferson and other health care systems throughout Philadelphia are utilizing telemedicine. Many health care professionals expect these practices to grow exponentially — but only if a few legislative hurdles are cleared. "I do think this is the future," Singh said. "Think about it. We don't even go to stores anymore to do our shopping. It's Amazon. Even for grocery stores, it's Instacart. That's how we all live our lives now." Why would medicine be any different? 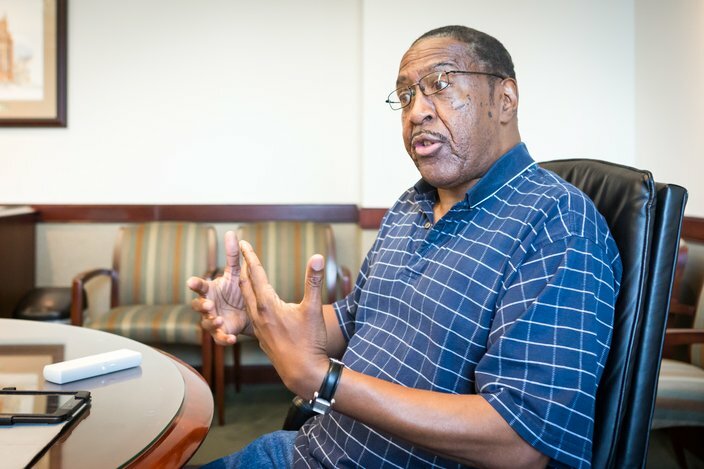 Ronny Neal, 59, of Germantown, explains how he uses telemedicine to treat his COPD. Telemedicine – the remote delivery of health care services via communication technologies – has been around for decades. The term was coined in the 1970s, but its modern use dates back to the 1960s, when television was used to facilitate consultations between medical professionals. For a while, telemedicine primarily was viewed as a tool for improving medical access to people living in remote or rural areas – particularly in developing countries. But throughout the last decade, medical professionals increasingly have recognized telemedicine as a valuable asset elsewhere, too. Likewise, evolving technologies and cultural changes have boosted demand. "Transformative might be too strong of a word, but it's definitely going to be a greater and greater part of how we provide care," said Dr. Bill Hanson, who oversees Penn Medicine's telemedicine efforts as chief medical information officer and vice president. "As an industry, it's increasingly the case that providers, like Penn, are responsible for taking care of patients over time. It's no longer (that) you come to the hospital and you go home and we're no longer interested in you." Today, each of the major Philadelphia health systems utilize telemedicine – in all sorts of ways. Penn Medicine offers virtual visits across a variety of specialties, including pre-screenings for varicose veins. The Children's Hospital of Philadelphia has an app that allows dermatology patients to upload pictures of skin issues and get video consultations. Jefferson Health has emergency physicians available 24/7 via its JeffConnect platform, allowing patients to connect with doctors at any time. Those are just some of the telemedicine services launched by those providers and others. Many of them are relatively new. But others have been around for a decade or more. In 2006, Temple University Health System launched a precursor to its Chronic Obstructive Pulmonary Disease telemedicine program. At the time, about 30 COPD patients used Palm Pilot handheld devices to log their daily respiratory symptoms. COPD, an inflammatory lung disease that causes regular coughing, wheezing and shortness of breath, makes it difficult for patients to know when they are truly getting sick. By tracking daily symptoms, doctors can intervene whenever a patient's symptoms deviate from baseline. "Our biggest challenge was not how to treat these patients," said Abhi Rastogi, associate hospital director of pulmonary services. Rather, "how do we keep these patients connected with our physicians? That's the true benefit of this technology." Today, the COPD program has more than 800 participants equipped with smartphones and handheld devices that measure air flow. Many live outside the Philadelphia region. When their symptoms flare up, they receive medical intervention within hours. Previously, the patients would wait several days for a clinical appointment or spend hours sitting in the emergency room as others with more acute issues were admitted first. Now, they know they can receive treatment virtually anywhere. "We receive check-ins from patients who are on a cruise line," Rastogi said. "They are comfortable doing that because they know that someone is connected to them at all times." Patients within the program experience fewer – and less severe – COPD exacerbation symptoms, enhancing their quality of life, according a study conducted three years ago. That, in turn, frees up emergency rooms, reduces hospitalizations and decreases medical costs – benefits also observed in many other telemedicine programs. Ronny Neal, 59, of Germantown, has suffered from COPD for 15 years, at times battling flare-ups that have landed him in the hospital. But the disease has not prompted a hospital visit since he enrolled in Temple's telemedicine program two years ago. Several times during that span, Neal's symptoms have deviated while visiting his sister in Connecticut. Each time, doctors have sent a prescription to a nearby pharmacy, mitigating the issue. "You can use this pretty much wherever you go and they can monitor your symptoms every day," Neal said. "It's a preventative measure and that's what you want. It's been working for me. Anything I can use to keep me from going to the hospital is a good thing." Dr. Pooja Singh, medical director of Jefferson's Living Donor Kidney Transplant program, holds an iPad used to communicate with donor candidates who cannot make it to Philadelphia for initial consults. The convenience of telemedicine stands as one of its primary advantages. Telemedicine does not work well when a medical professional needs to lay a hand on the patient – like treating a laceration. Nor can imaging or medical tests be conducted remotely, though Hanson said robotics eventually may make strides there. And then there are the health insurance coverage and payment issues. "I think that part of the industry hasn't caught up with all of the advancements yet," Rastogi said. "That's one of the biggest challenges with telemedicine. It isn't widely accepted by the payers in terms of reimbursement." In some states, including Pennsylvania, health insurers are free to classify telemedicine services differently than traditional medical services. In doing so, they often do not cover various telemedicine services or they do not offer reimbursements at the same rate as they do traditional services. Insurers "have prevented payment via telehealth by making it something different and most ... refusing to pay for it," said Dr. Judd Hollander, who oversees innovative health care delivery opportunities at Jefferson Health. "That's what really is preventing the growth." Hollander questioned that rationale, wondering why the health care means should affect payment of the same service. That would be like an insurer covering eyeglasses but not contact lenses, he suggested. "It's the medical care we should be talking about — not the way I do the medical care, or not whether I'm wearing contact lenses or glasses," Hollander said. "So we focus the conversation wrong. That's my concern." Telemedicine services tend to be classified within three modalities: live video services, remote patient monitoring, and storeforward services in which patients capture information for specialists to view later. Live video services tend to be the most widely covered by insurers, said Mei Kwong, executive director of the Center for Connected Health Policy in Sacramento, California. But insurers have questioned the effectiveness of telemedicine while also voicing concerns about about fraud and overuse. "Your policy moves a lot slower than innovation," Kwong said. "What you have right now is a disparity in that. The technology is where it can do this now. But the policy is probably a couple decades old." Many states have taken legislative action to rectify coverage imbalances, including Delaware, which requires insurers to cover telemedicine both on the same basis and at the same reimbursement rate as in-person medical services. New Jersey adopted a coverage parity law in 2017 that mandates that any in-person medical service be covered via telemedicine. But insurers are able to negotiate different reimbursement rates. Pennsylvania has not passed any laws governing payment. A parity bill passed the state Senate, but the House pulled it from consideration in September. PhillyVoice asked several health insurers to comment on the both the advantages and challenges presented by telemedicine. Only Independence Blue Cross responded. Telemedicine could reduce health care costs thanks to its potential to increase patient compliance and expedite treatment of various ailments, according to Dr. Ronald Brooks, IBX senior medical director. "This is still a technology that is being discovered and I think there will be increased utilization," Brooks said. "Hopefully, we will find out where it works best so that it will wind up improving health care and at the same time end up reducing costs." IBX primarily defines telemedicine services as those including a video component, Brooks said. Reimbursement payments are based on the length of the visit. "They are usually priced below an office visit because the office visit obviously does allow for more information gathering," Brooks said. "For example, when you go into a doctor's office, they take your blood pressure, they take your weight. Also, from a resource standpoint, they have brick and mortar overhead that goes into it." To insurers, Brooks said, it makes sense to reimburse providers more for traditional services, arguing the ability to physically examine a patient is "very important." "If a (parity) law got passed, we would just have to live with it and see how it would play out," Brooks said. "I can't tell you whether that would help or hurt." Yet, some providers say the absence of parity stunts the growth of telemedicine. Investment is limited because providers do not know whether insurers will pay for new services. "For us to replace face-to-face visits for unreimbursed televisits – that doesn't make business sense for us," Hanson said. "If the insurance companies are not paying for us to engage in telemedicine care, it's hard for us to offer it. Having said that, where it makes sense for us ... we are moving rapidly with telecare." In February, Penn Medicine launched the Penn Center for Connected Care, centralizing its telemedicine activities. That includes its nearly 15-year-old teleICU, a tele-homecare service for chronically ill patients and a tele-urgent care service. At the center, more than 50 full-time employees support patients around the clock. "We have a whole range of different situations where you have providers who are beginning to weave this approach into their practice, where appropriate," Hanson said. 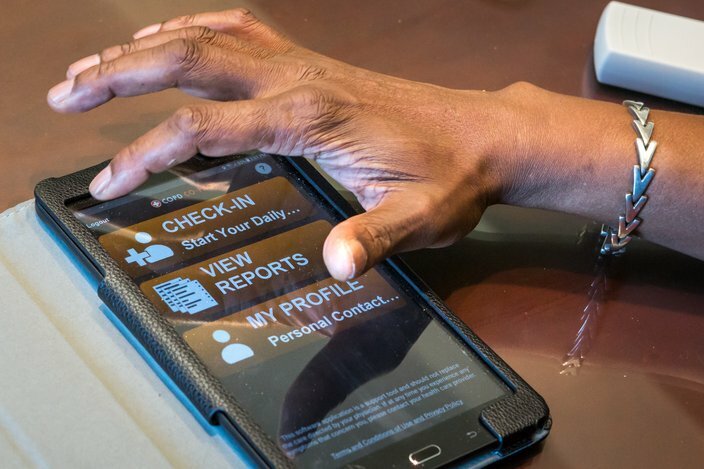 Ronny Neal, 59, of Germantown, uses the telehealth app “COPD Co-Pilot” to log his symptoms every day. When they deviate from his baseline, doctors determine treatment within hours. New telemedicine programs continue to debut throughout the region. Last spring, the Children's Hospital of Philadelphia rolled out a telemedicine program in the Norristown Area School District, giving school nurses the opportunity to have a doctor examine a sick student via a web camera and digital medical equipment. The pilot program – believed to be the first of its kind in Pennsylvania – aims to boost the capabilities of school nurses, who cannot diagnose conditions, and increase students' access to primary care physicians. "We can look into their ear, but we can't say, 'This is an ear infection,'" said Eileen McKeron, a school nurse within the district. "A lot of times you'll call a parent and say 'Joey has an earache. He doesn't have a fever, but it's really bothering him. We suggest you check him into a doctor.'" Thanks to telemedicine, such students can now see a doctor immediately, obtain a diagnosis and, if necessary, have a prescription sent to a pharmacy. They miss less class time and parents may not need to take off time from work. Tina Chaaraoui found the program beneficial when her 14-year-old daughter, Kayla, came down with an ear infection last spring. "By that afternoon, they had called in a prescription for her ear drops," Chaaraoui said. "I didn't have to call the doctor, leave work, or pick her up at school – the whole nine yards. It's really convenient." CHOP is offering the program to students for free, knowing that many in the district lack health care. The United Way of Greater Philadelphia and Southern New Jersey provided the equipment. And a team of 24 CHOP professionals volunteers its time to the program. "We really just believe in the value of it," said Tracey Haines, a digital health portfolio leader at CHOP. "It just makes sense to take care of them when they get sick, where they get sick." A digital stethoscope allows doctors to listen to the abdomen, heart and lungs. Another device enables them to view the throat or inner ear. Doctors also can inspect rashes – which often force children to go home, due to fears of contagion – and examine other issues. "What's really cool about our system is that it's not just the video conferencing platform, but it's a device that allows the nurse in Norristown to get really great pictures of the throat," said Dr. Bonnie Offit, clinical adviser for CHOP's Office of Digital Health. "It gets great pictures of the eardrum. It's a live visit that I'm doing with the child, but it's not just FaceTime." Eventually, school telemedicine programs could evolve to include mental health screenings or chronic disease management. And one day, parents may have technology similar to the ones being used by Norristown nurses. A similar device already sells for about $300, Offit said. "You can do a surprising amount of things with another pair of hands," Offit said. "It's more the question, What can't we do with the telehealth visit?"